Happy Monday Everyone! My internship wanted us to have some “lasting memories” and team building activities before the program ends. So they paid for us to go to this Adventure Park in Virginia Beach. 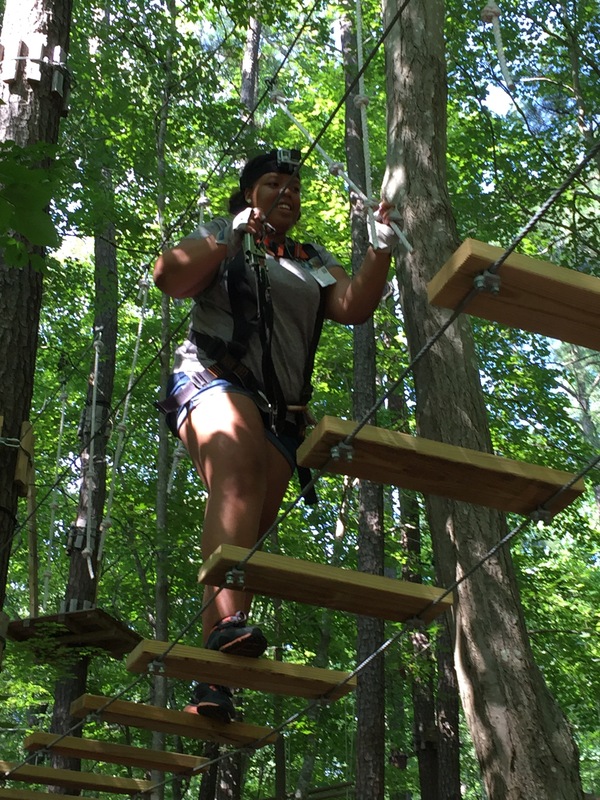 So basically, it’s like a ropes obstacle course up in the trees. So I have a slight extreme fear of heights. I had already decided earlier in the week that I was not going to get up in the trees – they can’t make me do anything, right? So fast forward to getting there, I spent 30 minutes debating if I was actually going to go up in the course. Mind you, this is probably the safest way to go climbing they have steel ropes that can hold up to 500 pounds. I finally go out there on the ropes and I felt so connected with God. Possibly because I was scared out of my mind, but I feel like my faith increased by like 50 million. It was just me and God, and my friend in front of me screaming for me to “keep going.” Afterwards, I felt so good. I accomplished something on my bucket list, as well as faced my fear. I feel like I can do anything I set my mind to with a little prayer and faith. I encourage all of you to do something that scares you. I believe that doing something that scares you, builds your confidence up. Even if it is something slight like making a phone call, doing mental math, public speaking, or even talking to your crush. Go Forth and conquer your fears, as well as build your confidence.